Bad news for Axis alone or bad sign for the entire market? Now, for three of the last four quarters, Axis has turned in weak growth. In this note, we dig into the trend, the issues and Axis's plan for the future. Last quarter (Q2 2012) was excellent, at 31% growth. 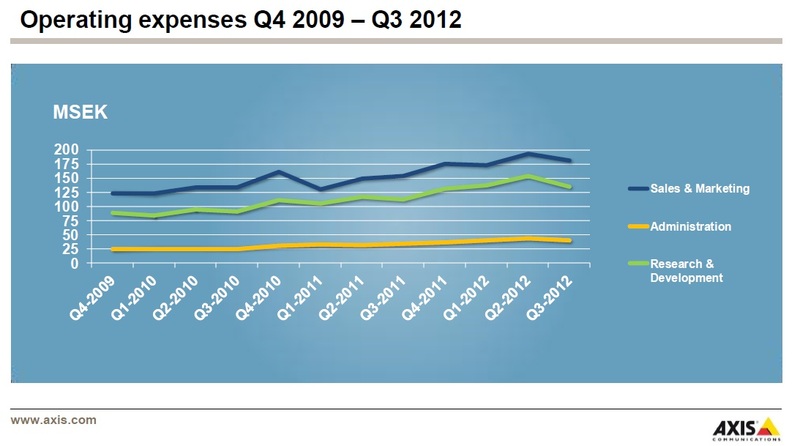 Prior to that (Q1 2012) it was 6% and the last quarter of 2011 was 22%. For an analog/legacy company, even this would be strong (though unsteady). For Axis, it is far below their historical pace, and significantly lower than their own guidance and general market projections. Geographical Split: Europe remains weak at 6% but the bigger issues was the Americas growing at only 7% (far below their historical pace). Asia grew the most at 20% but that's on a very small base and in a region that is supposed to growing even faster. Causes: Axis cites 'economic uncertainty' and admits 'some caution among our partners' and that 'sales slower than expected'. At the same time, the company is still expects 'long term growth potential of 25 percent per year'. Declining Spending: Both R&D and Sales & Marketing expenses dropped notably quarter over quarter for the first time in 2 years. Profits: Both net and gross profits were relatively unchanged from the few previous quarters. 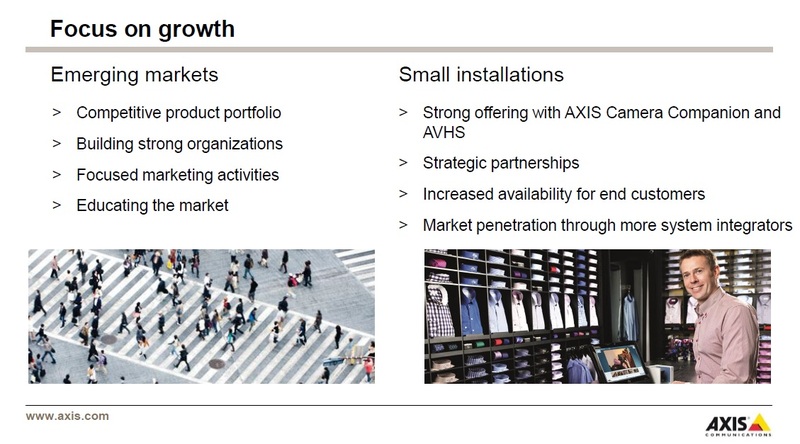 Future Focus: Axis highlighted two key areas for growth: emerging markets and small installations. Axis is betting on growth outside of Europe and North America to drive its expansion. While they cite projections for the global video surveillance market average 14.1% growth from 2011 to 2016, most of that projection is based on emerging markets like the BRIC countries. Not only will it be interesting to see if those countries can achieve these bullish projections but it will also be an accomplishment if Axis can become a major player there (today, e.g., only 11% of Axis's revenue is from Asia and its growth rate in that region has been modest). For growing small installations, Axis desires "increased availability for end customers" and "market penetration through more system integrators" though this is like saying the Pacific Ocean needs more water. How they execute on these goals will be important and worth watching. With Europe's overall economic conditions remaining so weak, it is a drag on growth for nearly everyone in the industry who operates there (and especially for Axis who until recently generated ~50% of their revenue there). Transition in Latter Stages: As IP has become so well accepted for professional use, the easy growth of replacing analog is becoming harder to come by. Over the next few years, the growth rate of the IP market will likely converge to the lower rate of the overall surveillance market. Scaling: Axis is so big now in the Americas (over $300 million USD in revenue this year) that it is likely becoming hard for them to grow at their historical 30-35% rate (to do so would be the equivalent of acquiring an Avigilon each year). The one thing we clearly see in Axis's favor is their unrivaled new product development. They continue to release more, high quality, innovative products that anyone in the market. Regardless of their growth levels, their strong competitive position should remain until and unless they weaken R&D.